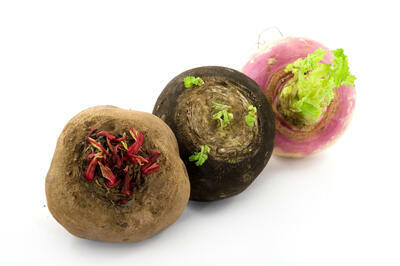 Do you know what is the difference between turnip and beet? You might have eaten beet in the school canteen but the majority of people doesn’t know what turnip tastes like. Do you even know how it looks like? First look gives you a hint that it is very similar to beet but inside it is not red, it is bright as potato. Get familiar with both plants and their healing power! Turnip and beet are kinds of root vegetables which are not at all demanding to grow. From both plants we mainly eat the root which has a shape of ball. Beet is both on the surface and inside colored in violet color. On the contrary, turnip has a lot of different colors. Taste of turnip and beet is sweet and a little bit spicy. In case you haven’t eaten none of these vegetables you can imagine that it tastes almost like kohlrabi. You can use both vegetables in the similar recipes. You can cut them in slices and bake them in the oven or add them to salads or soups. Neither turnip nor beet belong to extremely beloved vegetables. Both plants have a reputation of very cheap ingredients which were mainly eaten in a “bad times”. It’s a pity because they contain much more healthy substances than more expensive kinds of vegetables! How to make a tasty juice out of turnip or beet? First of all you need a high-performance juicer. We recommend single auger juicer which can juice even a very hard root vegetables. Cut smaller tubers in pieces and put them in the machine. Fresh beet juice rather water down, its detoxication effect could be too strong. During cleaning the organism very often come about very unpleasant feelings which could even lead to migraine or fever. Put everything in the decent juicer and you get nicely violet drink full of antioxidants, vitamins and minerals which you can drink every day.